I saw this video with the caption “This is the kind of horse they don’t sell to Americans”. The horse is bold, athletic, brave, well trained, and beautiful! Simply put, he’s amazing. I personally don’t have experience importing horses from Europe to the USA so I thought I’d put the question out there to you. Do you think Europeans sell Americans “lesser” horses and keep the good ones in Europe? I honestly don’t know what to think. I’ve had friends who imported amazing horses from Europe that they loved, but I’ve also seen some that weren’t that impressive. What do you think? Share this on Facebook if you think this horse is AMAZING and his owners are very lucky (regardless of where they live)! 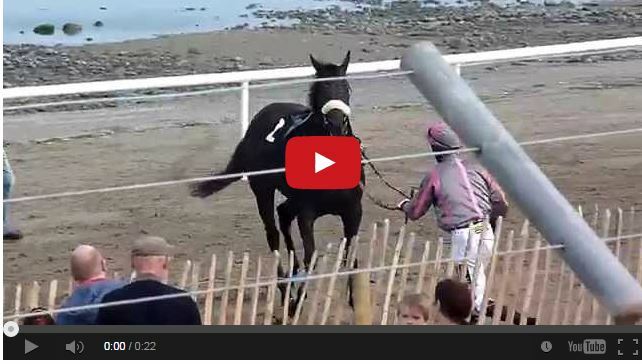 Watch This Racehorse Spook And The Jockey Land On His FEET!!! 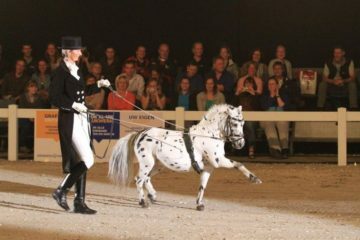 The Cutest Mini Ever Will SHOCK You With His Dressage Moves! I’m an equine massage therapist. Watching this video was a real treat. Thanks for posting. I can see that this horse would do even better with consistent bodywork. There’s tightness/imbalance on one side. Beautiful work between horse and rider. 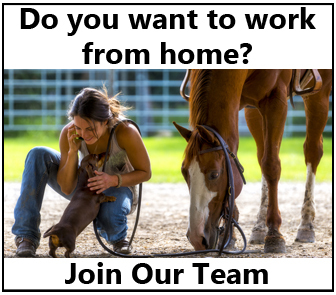 To answer your question, I think it is the relationship, the communication, the structure of the horse and the rider to be able to work as a team. This was like watching a ballet. Does it have anything to do with region? To some extent yes. I’ve heard this comment many times. Who knows. You have to be lucky when it comes to buying any horse. Patience, patience, patience. This horse is amazing and so is the rider. Lovely horse and very athletic. I would have liked to see the rider give him more rein rather than keep his head tucked so unnaturally. I would bet that the horse didn’t appreciate having the bit in his sinuses. What bit? That was a hackamore, which was wonderful to see in serious competition. Great team! Just another slam , ignore it . There was a Irish race horse named Shegar and when he retired as a champion the Irish people protested the export of this stallion to the U.S. So yes I would say that they do keep the better horses to themselves. You need to take consideration that land is limited over . They must agonize over weather to breeding bc they don’t have unlimited pastures like we are afforded here in America. I’m not saying we don’t have great horses here I’m just saying we aren’t as scrupulous out breeding here. Amen, Lisa Smarsh. This is exactly right. In America we can breed anything to anything good or bad. In Europe, they keep a very tight rein (excuse the pun) on what can be bred. Just how it is. Should be that way here!! If you want a horse of this caliber you have to pay for it. Most people that I know import horses costing under 100,000. Recently a jumper sold for what? 7,000,000. You can have a really talented horse and ruin them by improper training.